Charnwood offer a range of "floating" extruded feeds for marine ducks and flamingos. The extrusion process "cooks" the starch ensuring maximum digestibility while injecting air into the disc allowing them to float on the water. All diets include natural marine protein (fish meal and shrimp) to compliment natural food sources like molluscs and are fully balanced and vitaminised to provide good growth, feathering and breeding performance. This balanced ration continues to use high levels of fish meal and shrimp as a replacement for the natural diet of molluscs, crustaceans and crabs. Feed as a maintenance and breeding diet (Additional oyster shell is useful during lay). Ingredients: Wheat, Fish meal, Prawn Meal, Maize meal, Hiprosoya, Dicalcium phosphate. Soya oil. Minerals and Vitamins. Contains high levels of marine protein (fish meal and shrimp) to improve digestion and maximise amino acid availability plus high vitamin and mineral levels and natural pigments to optimise egg production and hatchability. Carophyll red is added to enhance plumage colour. Ingredients: Wheat, Hi-pro Soya, Fish meal, Maize meal, Full fat Soya, Full fat Linseed, Grass meal, Limestone, Soya oil, Prawn meal, Dicalcium phosphate, Minerals & Vitamins, Carophyll Red. 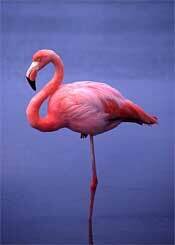 This balanced follow on ration is designed for continued growth, health and condition in the adult flamingo. It contains high levels of marine protein and Carophyll red is added to enhance plumage colour This ration can be crumbled for very young chicks. Ingredients: Wheat, Fish meal, Maize meal, Hi-pro Soya, Prawn meal, Soya oil, Dicalcium phosphate, Minerals & Vitamins, Carophyll red.